The set-up with “normal-short” distances forces the rider to control his approach, which will bring, among other things, some improvements in the way the rider’s mind works. If something goes wrong, the root of the problem often occurs a few seconds before. The difficulty of the exercise is also to stay very straight on the approach and on the fence. Again, keeping the panoramic vision is very important. 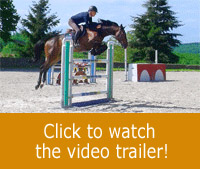 The horse also needs a correct trajectory on the jump to go thru the set-up properly. 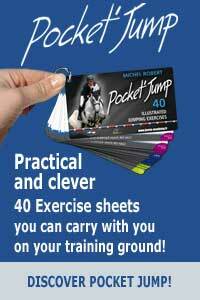 This exercise will help horses that aren’t comfortable on combinations to gain confidence. As this exercise is easy, horses of all levels can do it. As the rider goes along, he can tighten his turns and combine a short path with a long path. The goal, of course, is to work for improvement still keeping in mind that perfection doesn’t exist.